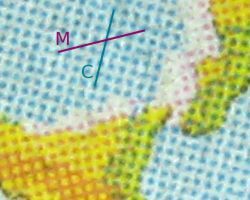 ↑ The “K” in CMYK stands for key, as in four-color printing, cyan, magenta, and yellow printing plates are carefully keyed or aligned with the key line of the black key plate. Some sources suggest that the “K” in CMYK comes from the last letter in “black”, for instance Mark Galer and Les Horvat (2002). Digital Imaging: Essential Skills. Focal Press. and Simon Jennings (2003). Artist's Color Manual: The Complete Guide to Working with Color. Chronicle Books. However, such explanations are likely inaccurate, plausible inventions of authors unfamiliar with traditional printing technology. Mark Gatter (2005). Getting It Right in Print: Digital Pre-press for Graphic Designers. Laurence King Publishing.